The Kinect hasn’t exactly wowed gamers, and reviews of the add-on have been tepid at best. Still, the rather elaborate motion-controller for the Xbox 360 has found fans among the hacking community, thanks to its impressive array of cameras and sensors. Resourceful modders have hooked the device up to computers, created elaborate shadow puppets and mapped 3-D models of rooms. Read on to check out a few of our favorite Kinect hacks floating around the Web. The brainchild of Emily Gobeille and Theo Watson, this impressive implementation uses the Kinect’s cameras to control a 3-D computer model. With the help of the gaming device, a CG bird mimics arm and hand movements. The Kinect even distinguishes between the thumb and the rest of the hand, making the bird squawk as a user’s hand opens and closes. Gobeille and Watson plan to introduce future refinements that also monitor distance. Someone had to do it, so why not the modder known as floemuc? He created a gestural, multi-touch UI that allows the user to browse, organize and zoom in on images by using hand gestures. It’s basically Microsoft’s Surface tech demo, minus the actual touch screen. It’s not exactly revolutionary, but it’s nice to know that it’s possible. 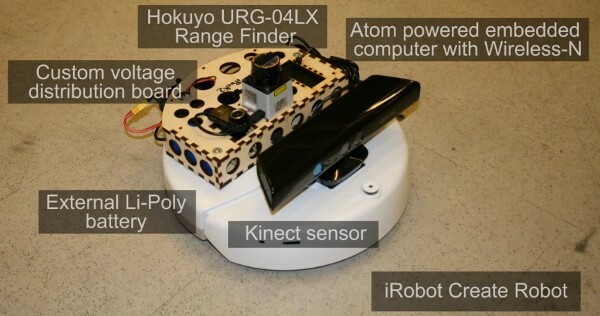 Using the Kinect’s video camera to help a Roomba navigate a room would be pointless, since the vacuum-bot does a good enough job as it is. But what about mounting the controller on a Roomba, using the data it gathers through its video and depth cameras to recreate a 3-D representation of the room — and then using that 3-D model to navigate the room? That’s impressive. Chris Rojas is letting others have the heavy hacking fun; he just wants to create beautiful images. His ‘Box Cloud‘ app takes the distance data collected by the infrared camera on the Kinect, and uses it to render people and their surroundings in floating neon cubes. Users can even employ an iPad to control tilt, zoom, pan and other render settings. Words can’t really do it justice. Just watch the video above. The Kinect’s depth-sensing tech inspired Oliver Kreylos to create software that combines images and data into an impressive, and slightly surreal, 3-D holographic video, which he can manipulate at will. Kreylos is not only able to pan, tilt and zoom the image, but he’s actually able to move around in three-dimensional space, too, without ever moving the camera. Check out the video, and watch for the creepy moment when the camera moves behind Oliver, and you can see his face through the back of his head.